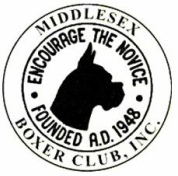 The Middlesex Boxer Club was formed some 60 years ago by a group of Massachusetts boxer fanciers who sought to educate and encourage each other with regard to the sport of showing dogs in conformation. Today we hope to broaden our "encouragement" to include many other related activities such as junior handling, obedience competition and information with regard to health issues and puppy search. We are always eager and happy to welcome new members to the club. Being a member in the Middlesex Boxer Club enables you to learn about all aspects of boxer ownership from some of our area's most successful owners/breeders. Members exchange their knowledge of breeding, genetic testing, selecting the "keeper" puppy, training and analyzing that puppy, grooming and conditioning, and competing in American Kennel Club conformation events, performance events or field and herding events. We meet monthly to plan fun events, discuss our breed and promote participation in American Kennel club events. We hold two Boxer specialties yearly in conjunction with all breed clubs. We also regularly host fun matches and education sessions specific to the purebred boxer. Check our events page to see what opportunities and activities we have coming up. Membership dues are very reasonable – currently $15 for individuals or $25 for a family membership per year. As a member you will be help shape and lead the direction of the club, promote the breed, make new friends in the boxer breed, and expand your horizons about the world of purebred boxers. What a deal!